It was a gift for my boyfriend and he really liked it. He liked the g-shock look but I couldnt afford it yet so I got this for him. He loved it. Excellent product, A+ officiant service! Myself as a returning costumer would recommend to all. I like a lot the watch. It has simple design, straight forward functions, very important that comes with a detailed manual though. Awesome! Better price, fairly quick delivery from U.K. to Sweden. Watch is exactly as described. This is an excellent watch for the money. Easy to set/set up and clear as to which mode/modes is active. Alround satisfaction with this purchase. I was amazed by the watch and it was looking absolutely stunning for a present and to be honest price wasnt that high in watch shop which makes me more addictive.i feel that watch shop is one of the great place to buy watches for any occasion and I already bought four watches from them as their services is excellent. They have delivered on the dot. I feel that I can recommended highly to friends and family rather than going some other high street retailer. Nice watch. Perfect for my gym sessions. Like size as well as it quite chunky. this product service it purchase but sounds like something rattles inside . Great watch, Ive wanted one for years and it hasnt disappointed. Its quite big and chunky on me, but I am incredibly skinny. Its bigger than most watches Ive owned, but it feels durable enough to suffer knocks and bumps. The strap feels good quality and has a slight stretch to it so i dont think it will break easily. The clasp which holds the excess strap together has a notch in it, so it doesnt come out of place, which is a great little feature. Water resistant to 100m not tested this fully yet, but you can certainly shower and bath with it on. It has a Countdown Timer, a Stopwatch, Sound Alarm and Vibration Alarm, and a Dual Time Function for tracking a different country. The light is bright, but doesnt stay on for very long, which is probably an issue if youre trying to use the timer functions in the dark, but its fine for just checking the time. I guess its to help prolong the battery life. The date and time functions are easy to set, and the instructions are actually quite clear. The date is displayed as Day of the week, then Month and Date. Great Value. A nice watch for the money, it is exactly as advertised and I am more than happy with this purchase! 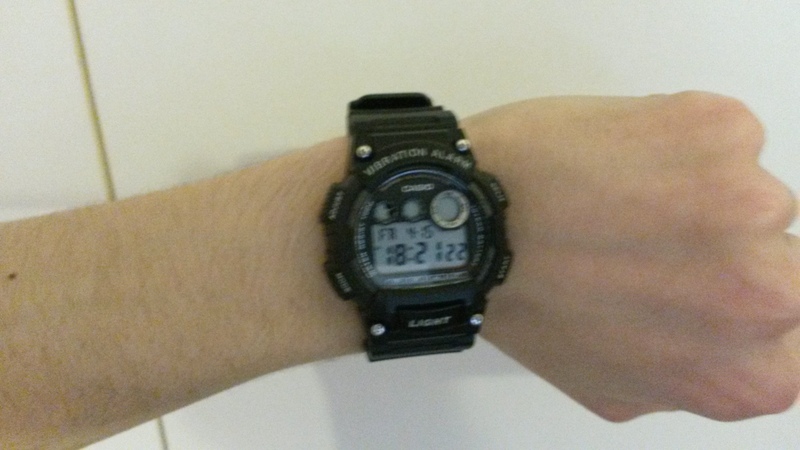 I found a Casio watch better and cheaper than my last one I purchased from watch shop ! Brilliant ! Well so far so good. Bought for a Christmas present. Cheaper than expected due to discounts and arrived in 2 days! Brilliant service. Watch is nice enough, light weight & good features. Unfortunately, the vibrating alarm was the reason I bought it, and this isnt good enough. Vibrations are not strong enough to wake me and only go for 10 seconds, with no snooze!!! I recently purchased this watch for work because it is relatively big and can withstand a large amount of knocks and bumps which is what my job entails. It is not the best looking watch although it makes up for this through the large range of features. Ive recently come back from my holiday and i can tell you that the 100m water resistance is absolute lies. I went scuba diving in the barrier reef, around 500+ metres under the water and it works perfectly still. I dont see why sharks dont purchase these watches to be honest with you. Very pleased good replacement for my unit which was 8 years old. Only down side it is a bit larger but very pleased. Great watch, light, comfortable and dies the job ! Great deal! Excellent value, came in good time, very pleased with product and price. Very good watch , worth the money ! This is a G-Shock right?! Not really but looks just as good for a fraction of the price and really does the job for what I need. Display is clear, light is really bright, good stopwatch and the vibrating alarm is superb as I can get woken up for my gym session without waking the wife! This is a brilliant watch, and a guaranteed liking. Its inexpensive, durable and has all the needed features in one. All the included features include classic feature like Vibration Alarm, Light, Illuminator, Timemode, Stop Watch Timer and Double Timing. It is also Water Resist up to 100M. 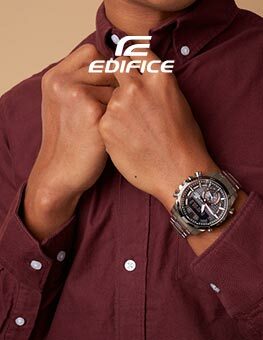 It shares the same anatomy and skin with G Shock™ the reason of the similarities alike. It consist with four function buttons [Adjust], [Mode], [Split] and [Start]. I own two G Shocks but this watch blends in perfectly. Its strong with its rock solid resin. Its ideal for those who do active sports and outdoor activities. Its great for people example who want a G Shock style watch or for people who prefer Casio® Standard. It has a 10 Year Battery and a 3 years warranty. 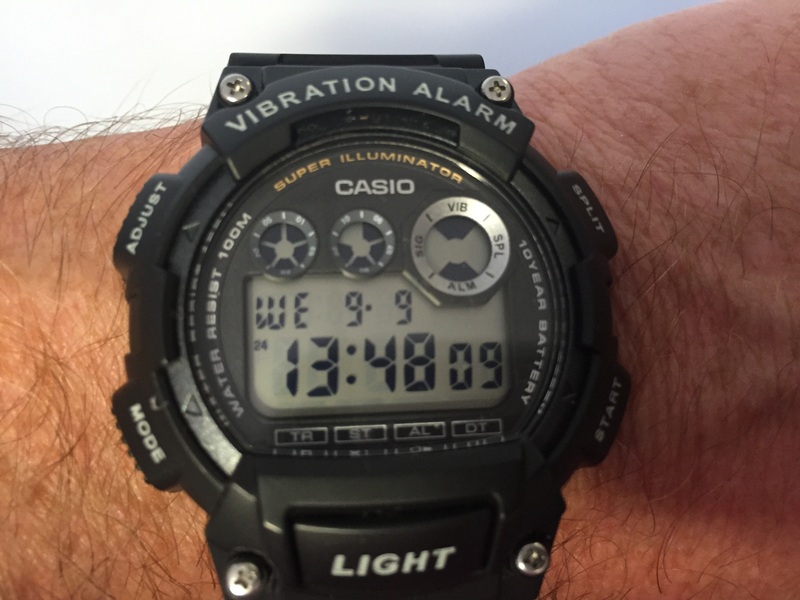 This model initially released in October 2000 and is part of the Casio® Collection. Brought watch mainly for vibration. Vibration not enough to wake some-up or remind you. So if you getting it for the vibration then you will be disappointed. I would advice using the alarm sound, as you can hit any button to turn it off. the sound and vibration last for approximately 8-10 seconds before it auto-matically turns off. Has basic needed functionality: stop watch timer alarm on the hour signal allow to set 1 other country time light Which lasts Max 3 seconds, maybe 2 seconds. If you use the light to many times it eats into the battery life - stated in instructions. It is good for outdoors as reflection on time/display not have much affect, but it still has a bit of a glare on clarity of display sometimes- definitely not all the time. Overall -- considering the price -- it is a good watch which arguably has better features than more expensive watches. So you would not lose out if you spent money on it, as it serves its function. Excellent watch bought for work. Excellent viewing with the light at night.haven,t tried the vibration alarm as yet. Excellent first purchase from the watch shop.excellent service,arrived quickly. Great watch for the money! Solid comfortable and does what it says. Already taken a few knocks and there is not a mark on it. A very handy for young kids.I have bought for my younger and he is very happy and excited to get it. Great watch, gives you the basics but also with a vibrating alarm which i use to for the gym because i have got parking tickets for staying longer than the 2.5 hours we are allowed! The watch itself it very well made and looks like it can survive for a while! Its very rugged and the light is good too. 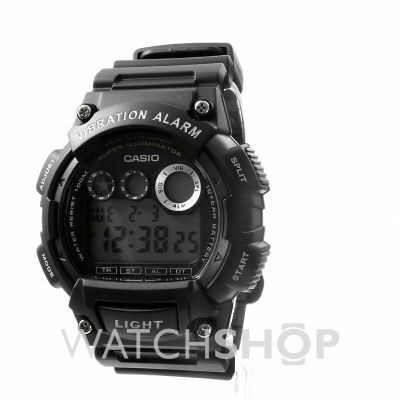 What a great watch, I was looking to replace my old Casio watch, so I was told by a to purchase this watch because I had a Casio before I never doubted its performance or built quality, I found it bought no regrets and its chunky and looks more expensive than it is. Needed a new water resistant watch at a good price and this fits the bill perfectly. Its a Casio what more is there to say, the watch is great. Would definitely recommend. Poors and smarts man G Shock. The watch is in almost all its Features a G Shock Casio.Flawless fit and finish,very light for its size,,sits well even on my small wrist,easy to read,packed with more functions then you will ever use,very bright Illumination,with a no nonsense-tactical look,this watch brings to you all the characteristics of a G Shock at 1/3 of its price.If for you its not so important the G shock logo or a 20 atm water resistence,and you are short on cash,then search no more-this is the watch to buy,and this is the lace to buy it from. Excellent service, very fast delivery well packaged.The watch was perfect for my nephew, hes made good use of the vibrating alarm in the mornings. Great product,looks good and sturdy. Quite masculine and does the job well. The unique feature this was bought for was the vibration alarm, we needed a discreet way of letting the wearer know what the time was without everybody hearing an alarm. The watch did not disappoint on this front. 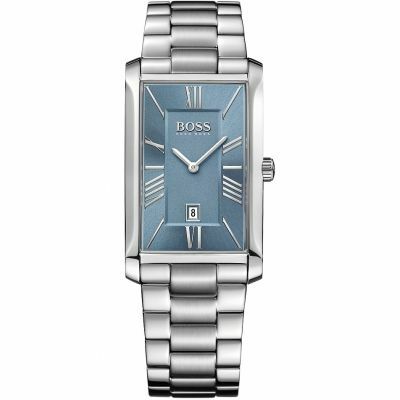 Excellent watch, good size , clear easy to read display and very good back light. Xmas present for my son and he is very happy with it. This was purchased as a gift for Christmas and it was exactly what was wanted. The person receiving the watch wanted a stop watch function as he is training to enter the London Marathon, so its just right. Great watch, just what I was looking for. Bought as a gift my other half who wanted a watch for work that he wouldnt be too bothered about getting scratched hes an engineer the light is a great function, easy to set up the date and time, good quality and delivery. This is a chunky watch with plenty of protection around the face to keep it defended against knocks and drops. It also has loads of functions. A great aspect of this watch’s design is the large buttons which means that it can be operated whilst wearing gloves. I work outside and need to use a countdown timer most of my day, so for me, the vibration alarm is very important as I can keep my hands warm in my pocket and still feel the alarm go off. Also, the large ‘Light’ button on the front of the watch makes it easy to locate and press in the dark. The bright light stays on for just enough to see the time but not on for too long saving the battery life. This watch does come with a generous 10-year battery life promise. The Dual Time function is useful for when you’re abroad as you can set local time, but still keep the time for back home visible. The display has a useful indicator bar that moves along the bottom as you switch through functions. Small letters denote which is mode is currently being used. This watch also has a useful audio indicator for use at night or just when it’s at your bedside. As you scroll through the various functions, you know when you’re back at the normal time display because you hear a different ‘bleep’ sound to the other functions. Another nice aspect of the design are the 3 round indicators at the top of the screen. Two of these show seconds passing by using a shape that rotates around the dials. The third larger dial shows which alarm mode has been selected, hourly signal, vibration alarm or normal audio alarm. You get a decent, tough and functional watch for the price. Its best feature is the hour display is BIG.Theres no point in a big watch if you cannot see the diplay because it is tiny and cluttered. My eyes struggle to see the date on some other Casios but on this one the date display is as big as the time display on some other models and the time display is bigger again. The name casio says it all for me anyway . But for those who need to no.ive used a gshock for years,and decided to buy another one.the value for money cant be challenged.this casio i bought gives me just what i need.they have a watch with the spec for most people.just look a your needs then go buy.one thing for sure durability and reliability always . cheers casio. Im really happy with watch its a christmas present for one of me nephews and I think hes going be over moon with it. Its got everything that I want as me nephew has autism and an alarm will sound when its time for him to go in at night. Would definitely recommend the watch shop to all of me friends &family. I was happy with the watch that I bought for my fiancé last christmas. And when youre happy with the product you always come back. I bought this watch for my sons 13th birthday & he absolutely loved it. Its looks sporty and robust enough to survive a typical teenage active lifestyle. The watch is very easy to adjust and the instructions are simple to follow. I would highly recommend this watch. Very good-looking sports watch. the vibration alarm helps not to disturb others with your alarm and also hear the alarm in noisy place. Great watch. Slow vibration alarm ideal for young families. Sporty look. Is even water resistant. I was originally looking for a far more expensive divers watch when this chunky black Casio caught my eye. At a fraction of the price, with more features but not too many! I decided to buy it. Im quiet an active person, who travels a lot, so the chances of a watch being owned by be getting scuffed, damaged or lost is quiet high, so the surprisingly small price tag made sense, I dont have to spend any time worrying about it like I would a more precious timepiece. Also the watch looks very chunky, robust & well built, so Im pretty sure it will put up with most things I put it though anyway. 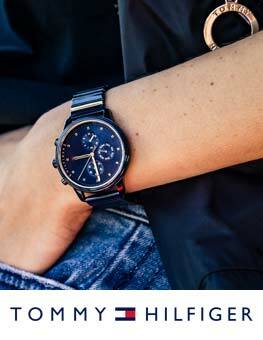 Looks the part for any occasion, simple to use & a great price from the watchshop & super fast delivery! a very happy customer! This is my first watch at the age of 23.. Lol its great im an active person so wanted a warmtch that could take some abuse so I went for this. im training for a sprint triathlon and it works great timing my swiming times. The alarm feature works really well and the fact you can have it vibrate rather than beep suits we better when it comes to waking me up. Good watch. Very quick delivery time. Would recommend to anyone. 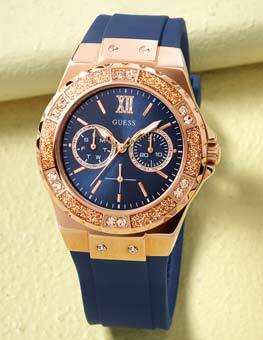 Huge range & variety of watches one to suit everyone. 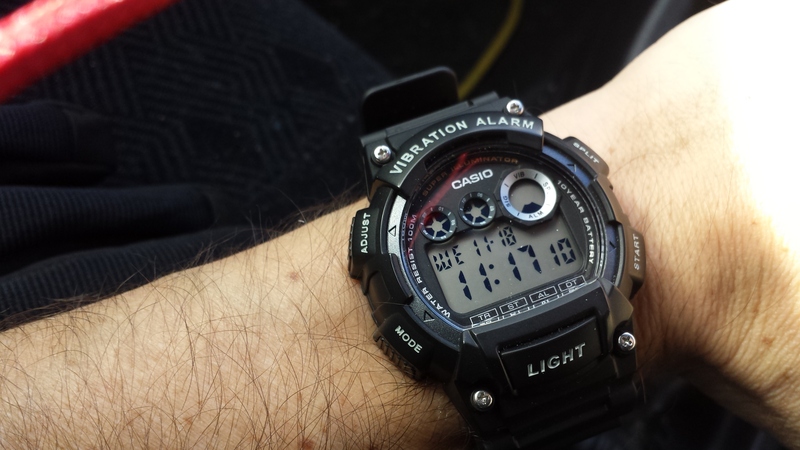 The Casio is a very nice watch and I love it. Nicely built and good quality for the price of the watch. The watch was very easy to set up took about 5 minutes. What I like about the watch is the vibration alarm gets me up every morning for work. The best feature is the light so when your out at night it gets quite hard to see the screen so you just press the light button and you can read the time like it was day time. I honestly cant think of any bad things about this watch. Excellent watch, robust, waterproof, strong, easy to use all the tools I need for my army carrea. Would definitely recommend to athletes/sports personnel wanting a cheap reliable peace of equipment What wont let you down. Nice black smart finish to it aswell making it look the part too. Wanted a change from my Nixon Venture Stainless Steel watch. 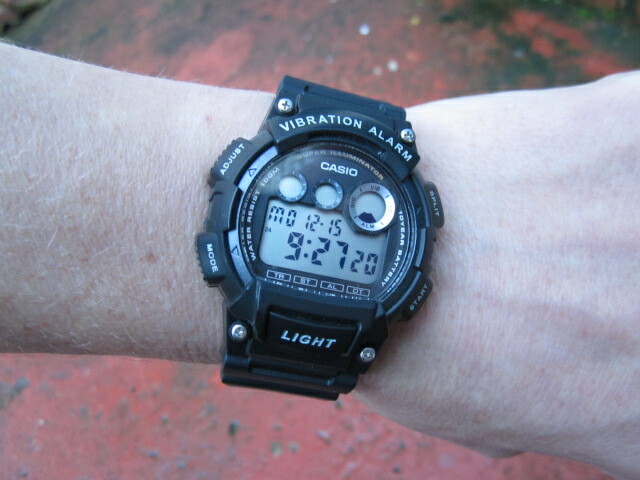 It started to stop keeping time correctly with decent batteries.... so decided to change to this excellent Casio number! 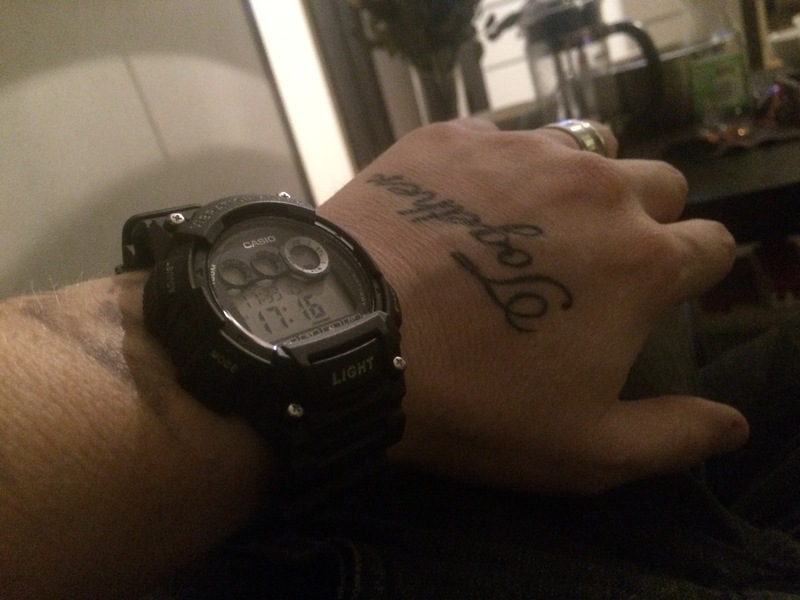 Always wanted a Casio when I was younger or a G-Shock. This watch fit the bill perfectly. 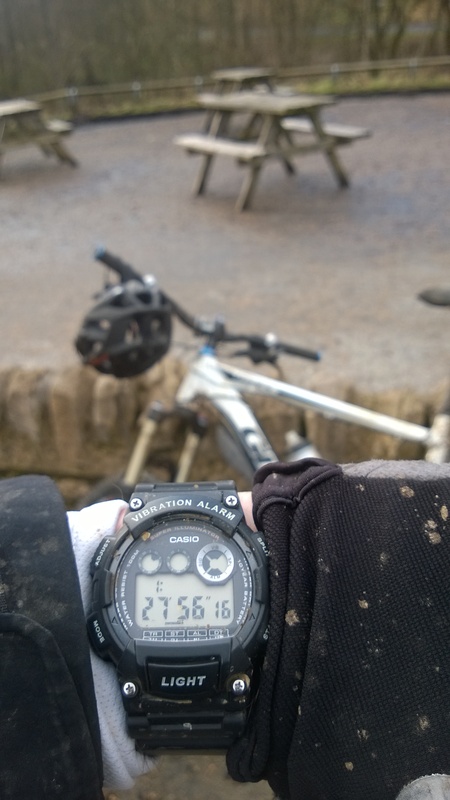 I am quite an active person and with my personal and work life my watches tend to get a bit of a beating on occasions. This watch is chunky and durable I am yet to mark it at all. The features on the watch are great, very easy to use, didnt even need the manual. Its light on your wrist unlike my last watch. The illumination is brilliant and very bright allowing me to clearly see the time etc in the dark. Needed a simple digital watch for work and this does the job perfectly. Very easy to set up and simple to follow instruction. Displays the day of the week, date and time all at once. Also has a useful light up function, and is actually quite comfortable. I would recommend it. The watch was exactly as we expected and my lad is very pleased with it, it was delivered on time, even with the Christmas rush. The only thing which annoys him is only one alarm can be set at a time. Nice watch. Bought it for my husband. Perfect tor waking him up and work schedules. Goes well with any clothing. This was bought as a gift for my father as he is old school and would like to keep it simple, and this watch offers that. The light is very luminous and functions the way he likes it, with just a touch and everything goes bright. The feature that was most appreciated was the vibration function which is just the silent alarm feature needed to not disturb those around you. I purchased this item as a gift, it came very quickly, well made item, brilliant value for money an product was well presented. All in all I was very impressed. Item looks just like the picture. 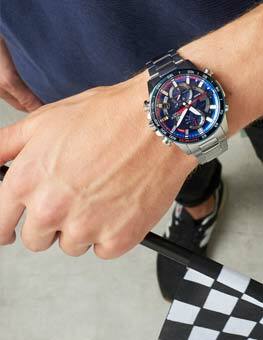 Id like the watch,it is amazing.I bought Casio G-shock and I think thats very strong and beautiful mens watch.